Babesia In The Blood? There Should Be A Test For That : Shots - Health News There's no test for a malaria-like parasite that has sickened people after blood transfusions. A recent report of illnesses tied to donated blood demonstrates the need for an assay, an American Red Cross researcher says. 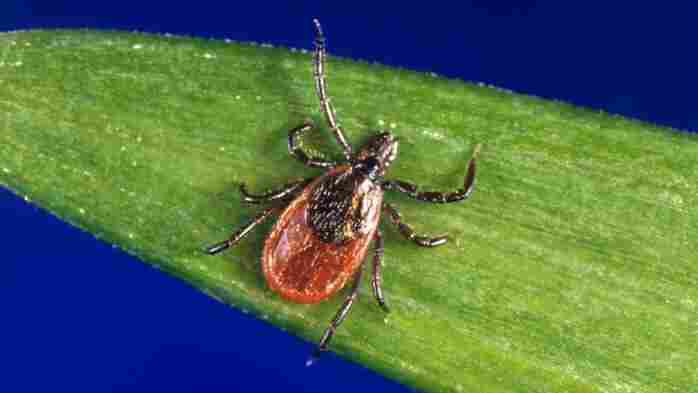 Deer ticks like this one can spread a parasite that causes babesiosis. And infected people can spread it through blood donations. Nobody likes ticks. Well, maybe some scientists who study them do. But civilians and people concerned with public health really are not fans. Earlier this week, we saw some new anti-tick fodder in a roundup of cases of babesiosis, an emerging illness that's usually transmitted by a tick's bite, or in some cases, by blood transfusions. A paper in the Annals of Internal Medicine described 159 cases of babesiosis, a malaria-like infection with the parasite Babesia microti, due to transfusions over a 31-year period ending in 2009. Some people died. And the figures, in all likelihood, underestimate the true extent of the illnesses. Cases of babesiosis are found mostly in the Northeast and Upper Midwest, where the parasite lives. But the illness is becoming a bigger public health worry, and the study showed the blood supply could spread it further. The big problem, as an accompanying editorial points out, is that there's no test to screen blood for the parasite. I talked about it with parasitologist David Leiby, who wrote the editorial and is the head of transmissible disease research at the American Red Cross' Holland Laboratory. "Technically, there are challenges, of course," he said, with developing a test. The parasite gets inside red blood cells which make it trickier to detect. But, he said, that's not "insurmountable." The bigger issue at the moment is economic. Because babesia are a regional rather than a national or international hazard, the market for a test is limited, which reduces the incentives for a company. And any test has to pass muster with the Food and Drug Administration, which isn't a trivial or inexpensive hurdle to clear. A test has to be very sensitive and fast, so blood can be screened quickly, he said. Cost, too, is an issue — a test has to be affordable. He says there's some momentum building for one, and he expects the recent report on transfusion-related illnesses will help galvanize action. And it's already the case that the National Heart Lung and Blood Institute has given a $214,000 grant to Immunetics, a company that develops blood assays, to work on one. For more on the rather disgusting, intertwined life cycles of babesia, ticks, mice and humans, there's a video below from the University of Rhode Island's Tick Encounter Resource Center.